One Time Mega Deal-Tigers Eye (Oct 9x7 mm) Bracelet (Size 7.5 Adjustable) in Platinum Plated 20.000 Ct.
One Time Deal- Norwegian Thulite (Ovl 14mm) Ring in Silver Plated 10.250 Ct. Innovation usually demands a hefty price tag, but TJC is a tad different, we ensure that we provide you with innovative products at an incredibly low pricing. Exclusive to TJC is the in-house brand Karis featuring our innovative Platinum and Gold bond jewellery especially for the fashion-savvy and experimental women of the UK. From rings to earrings, bracelets, bangles and necklaces, Karis has an extensive collection of designs that you will love forever. Gold and Platinum overlay on Sterling Silver for a luxurious look has been favoured and loved by women across the globe for years now but the concept of bonded metals is a rather new one. It is not only more durable but looks much more alike to the original precious metals. Flawlessly crafted in a mix of metals with Sterling Silver, every piece under the Karis brand is uniquely beautiful and elegant with a premium feel. 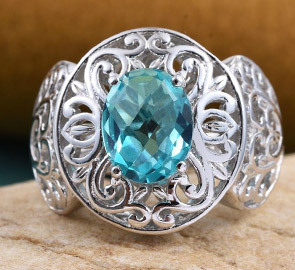 Perfect for budget shoppers, jewellery under Karis features a variety of precious gemstones ranging from Diamond, Emerald, Tanzanite and Amethyst to Turquoise, Quartz, Lapis Lazuli, Garnet, Citrine and Swarovski. With impeccable craftsmanship and artistic designs, the Karis jewellery is an impressive amalgamation of chic, contemporary, and classic pieces that will make sure you have a put-together look always. Be it evening soirees or luncheons with friends or colleagues, there are statement bracelets, rings and necklaces to set apart your style. Flaunting as humble a price tag as possible, the everyday pieces like cuff bangles, solitaire rings and petite pendants are must haves for every gorgeous lady in the UK. Karis allows you to choose a premium look at a price you’ll love, pick a piece for your own self or choose as an exquisite gift for a loved one, today. We at TJC understand your distinct needs and strive to provide you with the best that money can buy. Look beautiful and perfect always with TJC!